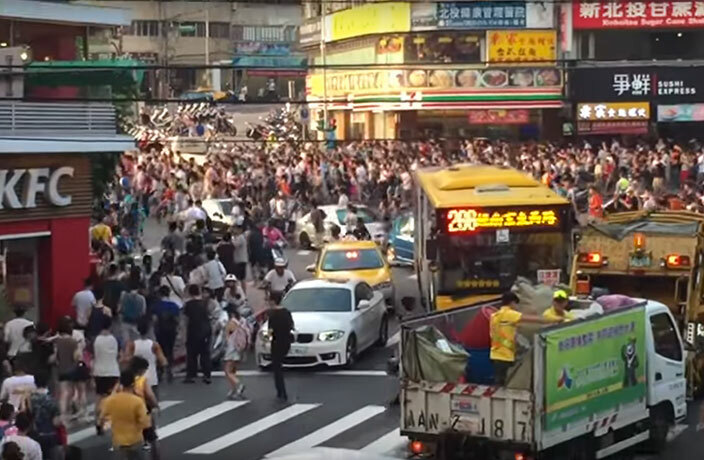 A video of hundreds of Pokemon Go players in Taiwan running to catch a Snorlax that is making the rounds online this week is proof that the Pokepocalypse is upon us. The unverified video was reportedly filmed in Taipei's Xinbeitou district, and was originally posted on Facebook before being uploaded to Youtube. In the video, a mob of hundreds of people can be seen pushing through an intersection with what Time calls "the urgency and intensity one usually expects of marathons or attempts to escape alien invasions or terrorist attacks." The crowds reportedly formed after a rare Snorlax was sighted. According to state media reports, Xinbeitou has become crowded with thousands of players since the game launched in Taiwan. The overcrowding has become such a problem that police reinforcements and the civil-defense brigade have had to be called in for added safety. Meanwhile, the game remains unavailable in Mainland China. Though that's probably for the best, TBH. On April 12, a woman in Taiwan called the police on a robot vacuum after mistaking the bot for a burglar.